USB 2.0 RG2224 Turnkey - Icron Technologies Corp.
Icron’s Turnkey solutions are complete USB extension solutions without enclosures. With the Turnkey systems, OEM customers can quickly and easily embed ExtremeUSB® into their end applications or custom enclosures. The USB 2.0 RG2224 Turnkey is a four-port extender solution, enabling USB 2.0 connections of up to 480Mbps over 500m (1,640 feet) of multi-mode fiber optics. 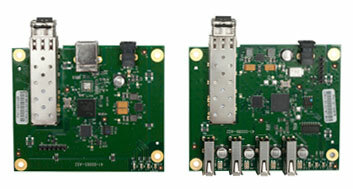 The USB 2.0 RG2224 Turnkey product is comprised of two separate printed circuit boards: the Local Extender and the Remote Extender for easy integration into a custom enclosure. Conventional USB cables are used to connect the Local unit to the host computer, and the remote USB device to the Remote unit. Multi-mode fiber optics is used to connect the Local and Remote units to support USB 2.0 480Mbps over a distance of up to 500m (1,640 feet) without the need of additional software drivers. The USB RG2224 provides true USB 2.0 extension at up to 480Mbps over 500m (1,640 feet) of single-mode fiber optics, without the need of additional software drivers. A true plug-and-play solution, the RG2224 is compatible with all leading operating systems, and supports all USB 1.1 and 2.0 device types from high-speed web cams, hard drives, printers, scanners, audio devices, touch screens, digital cameras and game controllers. An integrated four port hub allows for extension of up to four USB devices without the need for an additional hub. The system is FCC Class B certified and meets EN-61000 16kV ESD immunity.